With FreeSync, gamers can experience seamless, fluid movement throughout hi-res, fast-paced games. FreeSync nearly eliminates tearing and stuttering that can occur because of differences between a graphic card's frame rate and a monitor's refresh rate. A monitor's response time is absolutely critical in games. The 1ms Motion Blur Reduction feature will allow gamers to enjoy the precision and accuracy needed to play at a very high level. With a response time that is virtually 1ms, blurring and ghosting are reduced to make the action smoother and gamer reactions more precise. Experience smoother and clearer gaming action with a 144Hz refresh rate. 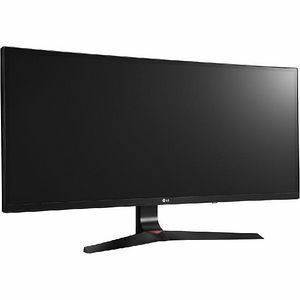 Games played on the LG 34UC79G are noticeably smoother when compared to monitors with refresh rates of 60Hz or 75Hz. Combine the smooth action with the curved screen, and gamers will love the optimized and immersive gaming experience. With the Crosshair feature, gamers can take their skills to the next level. By placing the striking point in the center of the display, the feature enhances firing accuracy in first-person shooter games.